3.Insert the test strip into the slot at the top of the Lactate Scout unitl is stops The arrow should face toward the analyzer. When the analyzer is turned off, this auomatically turns the analyzer on and activates the measurement mode. 4.Lower the end of the inserted strip to a freshly created blood drop. Avoid direct contact with the skin surface. 5.The blood will be sucked into the monitor chamber through capillary action. 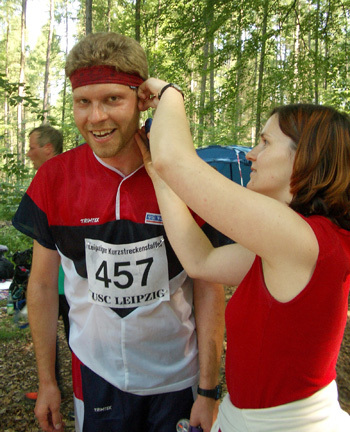 6.Here someone is applying a test strip to blood drop. 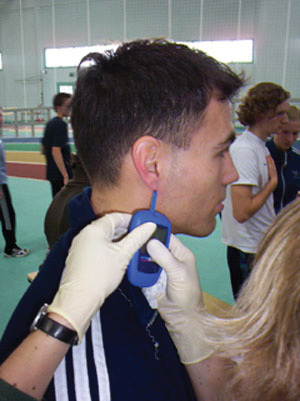 7.A sample is taken from an athlete's ear at an indoor facility during a testing procedure. 8.A sample is taken from the ear during an outdoor event. Hey that wasn't so bad. This athlete looks like he cannot wait till his next blood lactate test. 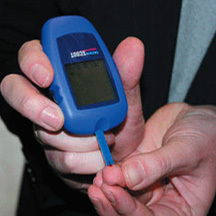 9.In 10 seconds you have a blood lactate reading. The athlete is on his or her way and you can get ready for the next athlete.